$90/mo. in months 13-24 (subject to change). *$35 ACTIVATION, EARLY TERMINATION FEE OF $20/MO. FOR EACH MONTH REMAINING ON AGMT., EQUIPMENT NON-RETURN & ADD’L FEES APPLY. Price incl. Entertainment Pkg. & is after $5/mo. autopay discount for 12 mo. Pay $40/mo. + taxes until credit starts w/in 3 bills. New approved residential customers only (equipment lease req’d). Credit card req’d (except MA & PA). Restr’s apply. Similar to DIRECTV’s SELECT™, the DIRECTV ENTERTAINMENT offers an exceptional line-up of channels at a very reasonable price. Watch the news, sports, and your favorite shows with your family and enjoy. Enjoy an everyday mix of channels with tons of sports than you get with the SELECT™ Package. Watch your favorite shows, latest sporting events, local and world news and more with this package. Get more playoffs and sports coverage with ESPN, ESPN 2 and FOX Sports 1 HD. 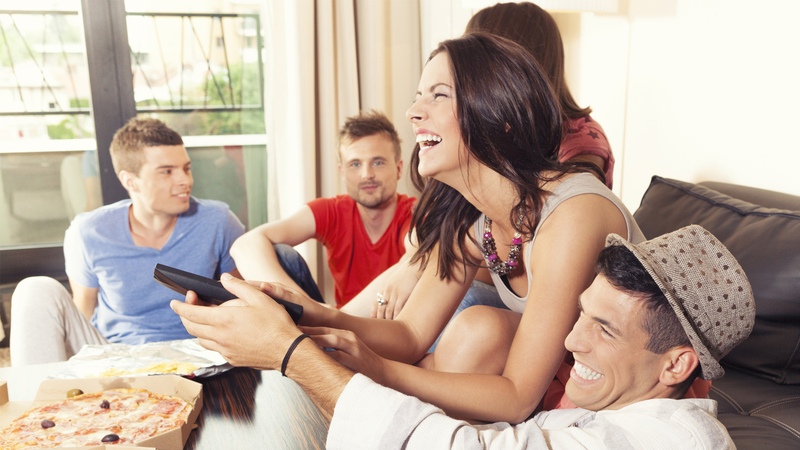 Choosing DIRECTV’s Entertainment package means you have enough programming choices for everyone in your household. And with hundreds of channels selections, you will always have something to watch! Tired of listening to boring old radio stations? DIRECTV Entertainment offers Sonic Tap service. It gives you access to the hottest music stations on Satellite Radio. Sign up and listen to the music you love the most! See the local stories that matter to you most, and see them in HD with DIRECTV. If you don’t need all the extras of bigger packages but still need your sports, the ENTERTAINMENT Package may be your best option. See the biggest games, extensive sports coverage and exclusive sports stories on ESPN, ESPN 2 and FOX Sports. Enjoy your favorite sports with DIRECTV’s action packed sports packages and get the NFL SUNDAY TICKET to watch every live out-of-market game, every Sunday! Your Source of Packed ENTERTAINMENT, Only By DIRECTV! Adding Internet to your package save your time and money when getting two services. If you want to save even more, add the most reliable and clear phone services. Check out the DIRECTV bundles page or call us now to learn more. With the HD DVR Technology, watching TV becomes really convenient for you. Want to watch two TV shows at the same time? DIRECTV’s Genie HD DVR has a solution for you! Now, with the new Genie DVR you can record up to 5 of your favorite shows simultaneously. Get it today and never miss a single moment of the shows you love. Get more of everything from DIRECTV promotional deals. Learn more about how you can get upgrades for your equipment and additional features for your package. Call us now and avail the special offers that add value to this already impressive package. Entertainment ALL INCLUDED PACKAGE: Ends 5/31/18. Available only in the U.S. (excludes Puerto Rico and U.S.V.I.). 1st & 2nd year Pricing: $40 for first 12 mos. only. After 12 mos. or loss of eligibility, then prevailing rate applies (currently $78/mo for SELECT All Included; $90/mo for ENTERTAINMENT All Included; $105/mo for CHOICE All Included; $117/mo for XTRA All Included; $128/mo for ULTIMATE All Included; $181/mo for PREMIER All Included), unless cancelled or changed prior to end of the promo period. Pricing subject to change. $5/mo. discount: Must enroll in autopay within 30 days of TV activation to receive bill credit starting in 1-3 bill cycles. First time credit will include all credits earned since meeting offer requirements. No credits in 2nd year for autopay. Includes: Entertainment All Included TV Pkg, monthly service & equipment fees for one Genie HD DVR, and standard pro installation. Exclusions: Price excludes, applicable use tax expense surcharge on retail value of installation, custom installation, equipment upgrades/add-ons (min. $99 one-time & $7/mo. monthly fees for each extra receiver/DIRECTV Ready TV/Device), and certain other add’l fees & charges. Different offers may apply for eligible multi-dwelling unit and telco customers.